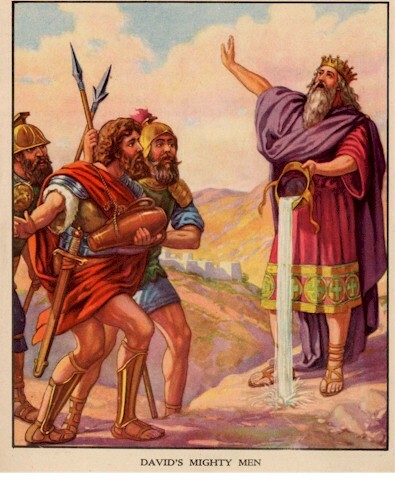 The Heroics of David’s Mighty Men – The Thirty and the Three. This chapter starts by portraying David in his last days speaking last words. He was reintroduced as the son of Jesse, who was raised on high and anointed of God, he was the sweet Psalmist of Israel. After a brief song, the chapter gave us an understanding of why David was successful – he had men who surrounded him, in whom courage like his had been instilled. i will make mention of the men and their notable exploits. the passage talked about the thirty, and also about the three mightest men. Adino the Eznite was firt mentioned, He lifted up his spear against eight hundred men and slew them all at one time. Eleazar the son of Dodo was next, he was one of the three mightest, at a time when Israel gathered against the Philistines and the men of Israel were gone away, Eleazar rose and smote the Philistines until his hand was weary, and his hand was clave unto his sword. he won victory for Israel that day, and others returned for the spoil. Shammah the son of Agee in similar fashion also stood when others fled, and he defended the piece of ground where the battle held, slaying the Philistines until God wrought a great victory for Israel. Adino, Eleazar and Shammah were the three who broke through the host of the Philistines when David was thirsty wanting water from Jerusalem, while the Philistines had surrounded it. He couldn’t have the drink but poured it out as an offering unto the Lord, as he saw it as the blood of these men who risked their lives. Abishai was also mentioned to be chief among David’s men. He lifted up his spear and slew three hundred men. Benaiah slew two lion-like men, and also slew a lion in the midst of a pit on a snowy day. Others were mentioned, totalling thirty seven in all, divided into the three, the thirty, and other notable mentions, including Uriah, the husband of Bathsheba. This makes us to put David’s sin in better context as Uriah was one of his mighty men of courage and valour. Notwithstanding, the main lesson from this passage is the fact that David was able to gather men similar to him, and enlist their loyalty unto death. Any great success will involve committed follower-ship, men we have been able to mould to with the same values we extol. Can you mentor such men? vs 16: And the three mighty men brake through the host of the Philistines, and drew water out of the well of Bethlehem, that was by the gate, and took it, and brought it to David: nevertheless he would not drink thereof, but poured it out unto the LORD. The Song of David – A prelude to the 18th Psalm!